In the spirit of Snoopy and Charlie Brown, or Calvin and Hobbes, please welcome Sophie and Doug. 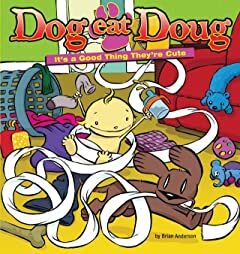 Dog Eat Doug is the cartooning creation of Brian Anderson that follows the daily exploits of Sophie, a cheese-loving chocolate Lab with a nose for the nuances of sarcasm and irony, and baby Doug, a healthy, happy newborn with no concept of jealousy and a limitless curiosity. Together, this dynamic duo adjusts to sharing the spotlight, the toys, and the affections of Mom and Dad, while exploring nature and its majesty, the couch and its cushions, and the cookie jar and its contents. 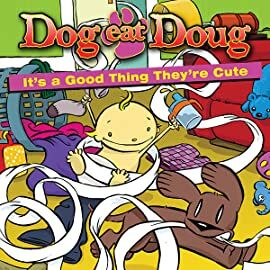 As the first Dog Eat Doug collection, this book features 43 weeks' worth of strips beginning with the cartoon's 2005 debut.